Figure 3, continued. 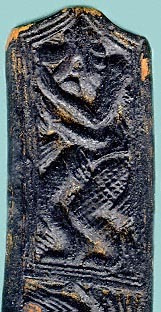 This sword-dao's wooden scabbard includes three figural carvings of what appear to be fantastic beasts. That on the upper left is from the tip of the scabbard on the side in which the blade is inserted. That on the upper right is from the mouth end of the surface opposite the blade side. The lower figure is from the tip on the side opposite that with the blade.